Before staying home full time with my children, I was a professional pro life pregnancy counselor and art therapist. After having my third child, I knew the Lord was calling me to stay home full time and I never thought about doing anything more. I was where I was supposed to be.....but in January, 2012, that changed. As we walked out of the service, she began asking questions about abortion. "Why does this happen, Mommy? Why would anyone want to kill a precious baby?" I quietly asked the Holy Spirit for guidance and answered her. She nodded her head sadly and said, "Mommy, I want to do something to help. Those babies may be small, but they are people too. I want to make something and give the monies to the mommies so that they don't have to do abortions." After thinking about it for a moment, her face lit up. "I know what I want to do!" she said. "I want to sew a cross and stuff the cross and on the cross I want to put a baby...because those babies suffer like Jesus suffered on the cross. Then on the baby I want to put a heart with rays of light shining from it." 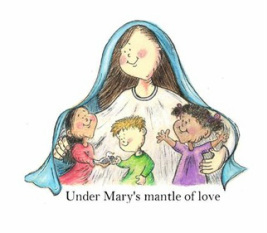 As she said that, I had an image in my heart of Grace praying her rosary and holding her pillow, like she does each night...and so that stuffed cross became a pillow and the baby became a pocket for either a rosary or a Christian prayer card...and the Prolife Prayer Pillow came to be. The Prolife Prayer Pillow comes in three designs with a variety of colors and fabrics to choose from. The first design is the original - the baby on the cross. The second design is Our Lady holding the baby. The baby applique is always a pocket for either a rosary or a Christian prayer card. The third design is our "Rose-ary" pillow with Mary holding the prolife rose in the palm of her hand. Each pillow costs $40 and proceeds go to local prolife organizations in Omaha, NE. For a list of organizations and descriptions, click link below. We are a non-profit organization. To purchase a prolife prayer pillow, click link below. The prayer pillow represents three calls to all of us regarding abortion. 1. A CALL TO PRAYER: We are all called to pray to end abortion. Prayer is one of the greatest weapons against evil. Abortion is one of the greatest evils. 2. A CALL TO EVANGELIZE: The prayer pillows are not your ordinary pillow. Perhaps they will stimulate conversation if you have one in your home. A person may ask what it is, and then you will have an opportunity to share the story and witness God's truth about the gift of life and the gift of the child. 3. A CALL TO ACTION: The prayer pillows represent a call to action. We are all called to act in different ways. It is important to ask the Lord what He desires of us in regards to being prolife and standing up against abortion. I asked, in prayer, to be told if my family and I were meant to do anything more for the prolife cause, and the answer was spoken through my 7 year old daughter, Grace. For children's hearts are pure. They have listening hearts which easilly see and hear God's truth and can lead us all closer to the Christ. Think for a moment about the truths that Grace received. First, she said, "Those babies may be small, but they are people too." She understood that no matter how small the unborn babies may be, they are still people who should be cherished and loved, not killed. The second truth that she received was that the babies suffer. She said, "Those babies suffer like Jesus suffered on the cross." Through this statement God shines a light on the reality of their suffering and aligns it with the redemptive suffering of Jesus Christ. Lastly, Grace said that she wanted to put a heart on the baby with rays of light shining from the heart. This speaks about the brightness of the heart of a child. For it is to such as these that the Kingdom of Heaven belongs to... Matthew 14. Jesus is saying here that children have the keys to the Kingdom and that they are bright lights for all of us as to how to get there. Young children have the humility, dependence, purity, joy, love and trust needed to enter into the Kingdom and to experience the Kingdom in their hearts here on earth. Their hearts truly are most like the heart of Jesus - and if we are wise, we will embrace that light and let them lead us and show us how to become childlike again with the Lord and enter into the Kingdom.